During the fiscal year 2011-12, the California Department of Education - Nutrition Services Division (NSD) established the Training and Education Needs Assessment (TENA) Advisory Committee with the goal of identifying trainings and educational resources needed by School Nutrition Program (SNP) to support their success and growth over the next three to five years. One of the recommendations from the TENA Advisory Committee was to develop an outreach toolkit to support SNPs, improve their image and increase participation in the meal program under the New Meal Pattern (NMP) requirements outlined in the Healthy, Hunger-Free Kids Act of 2010. In order to develop a well-rounded toolkit, the Advisory Group was formed with representation from small, medium and large school districts, the California School Nutrition Association, the TENA Advisory Committee, the California Food Policy Advocates, the California Endowment, and staff from the NSD. Over the course of three meetings-two conference calls and one in-person meeting-the Advisory Group reviewed and developed templates and fact sheets for various stakeholders. The material allows for tailoring to various media (print, radio, social media, etc.) as well as audiences (students, parents, school board, community, staff, teachers, etc.) to best fit the needs of California. School food service directors need tools to effectively market and promote the work school districts are doing to improve students’ nutrition and health. 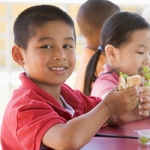 This toolkit will assist districts in their efforts to increase student and community awareness regarding improvements in the school meal program which will create a positive change for public nutrition.